Powers/Abilities: Ranephi's magic powers enabled him to command Earth, Air, Fire and Water. He could shape a whole forest, he could raise strong winds, he could shoot flames from his hands and control the waters of a river. He could watch events happening not so far from his castle, using a mirror, and his knowledge included forgotten languages. He also knew potions to apply to animals in order to make them stronger and to control them. He also did not age. (Savage Sword of Conan#8 (fb) - BTS) - Ranephi was a sorcerer who sought immortality. To achieve it he made a pact with the elder Gods, who let him drink from the Forever Phial. The prize was eternal life, but it was also the price to pay, as Ranephi understood many years after. The Gods created two guardians which protected Ranephi, stating that he could only be killed by the man who would defeat them. Ranephi was powerful and feared. Among his knowledge were the books of Skelos, Vathelos and Kathulos. (Savage Sword of Conan#8 (fb)) - Time passed. Ranephi became bored of eternal life and sought new ways for spending his time and also started seeking death. The sorcerer performed experiments and studies upon animals and human beings. Many people were kidnapped by him, many died and many were tranformed, becoming his obscenely deformed prisoners. One among them was Hannibal, whose wife was kidnapped by Ranephi, then killed before Hannibal's eyes. Ranephi also transformed the man, but eventually let him go. (Savage Sword of Conan#8) - Ranephi arrived at the point of hating life and the Elder Gods as well, who kept him chained to life. One night, looking through his mirror, Ranephi saw a strong barbarian in the woods near his castle. To test him he sent the Wolf Wraith. When he saw Conan killing the beast, one of the guardians created by the Elder Gods, hope grew within Ranephi, that this warrior could be his way to freedom. He released his beasts and burnt his magic books, while Conan reached the nearby town and was given a horse by Hannibal to escape. Then Ranephi used his magic to reshape the woods around his castle to lure the fugitive barbarian right to him. The second guardian came to life, an elemental, a statue of stone and fire. Ranephi watched while the barbarian managed to survive, entering the castle, and when Conan ran on a narrow bridge, Ranephi commanded the the waters below to envelope the warrior. But the warrior, with his last gasp, hurled himself toward the flaming statue, evaporating the water, and putting out the flame so that the guardian became again an inanimate stone statue. Mere moments passed before the warrior smashed the door of Ranephi's room, wielding an axe in his hand. Ranephi gave him another trial to pass, strong winds battered the room and Conan resisted, proving to be the one Ranephi expected after a life without purpose. Death was dealt to Ranephi, he welcomed the freedom it gave him. Comments: Created by Roy Thomas (writer) and Tim Conrad (pencils and inks). No names were mentioned for the Elder Gods known to Ranephi. My guess is that they could be the Elder Gods, Chthon, Set, Gaea and Oshtur, only because Ranephi's magic greatly involved the four elements, Fire, Water, Earth and Water, which can be linked again, respectively, to the four Elder Gods. It's only a guess. They could've been the N'Garai. They were often called Elder Gods in Claremont comics. Mistakenly, but they were known that way. Among his books of magic, Ranephi considered the Book of Skelos, the Book of Vathelos and the Book of Kathulos, the most dangerous, but only because they could be understood by ignorant people. He burned many papyrus and parchments, but many other books remained undamaged in the castle. Ranephi's books were written by pretty obscure authors. 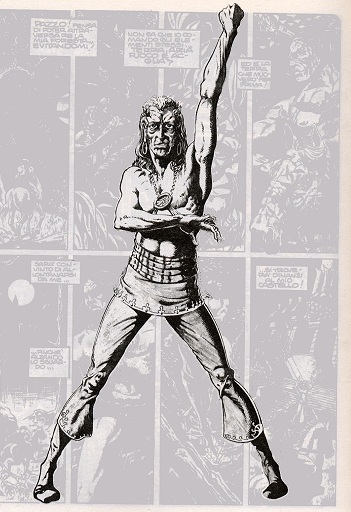 Kathulos, though originally a Robert E. Howard creation, could be the demon or whatever he was from Marvel Premiere#8 (May, 1973). 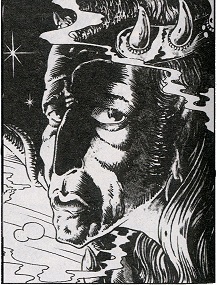 Vathelos the Blind appeared in Conan the Barbarian I#85 (April, 1978) and was also a REH creation. Skelos was a classic Conan deity. Afaik the latter two were both first mentioned in Black Colossus (1933). Ranephi has no known connections to any other character with a similar name. any other "Wolf" or "Wraith" character. The guardians were created by the Elder Gods to protect Ranephi. The Gods stated that Ranephi could not be completely immortal, and that he could be killed if someone would be able to defeat the guardians. The first guardian was a white wolf, a wraith, far stronger than a normal human. It was slain by Conan without much effort. The second guardian was, apparently, a tall stone statue of a woman. Actually the statue was alive and could release the fire which was within her, encasing the statue burning in very hot flames. It came to life when Conan approached the castle and immediately attacked him. The sword of Conan cut her wrist but was melted by the heat. Again it passed through a metal door melting it, but when Conan hit it with water the statue became stone and stiff again. Hannibal was a normal human mutated by magic. Hannibal lived with his wife in the village near Ranephi's castle. When Ranephi kidnapped his wife, Hannibal followed them only to be captured and forced to watch while she was killed, becoming bones and dust. Hannibal underwent some experiments and was mutated, becoming a shorter, crippled hunchback. Afterward he was released. From that day on Hannibal always tried to help the strangers who passed near the village, knowing that they were prey for Ranephi's experiments. Hannibal did the same for Conan, giving him his horse to escape. In the end Conan did not succeed in escaping and instead he killed the sorcerer.